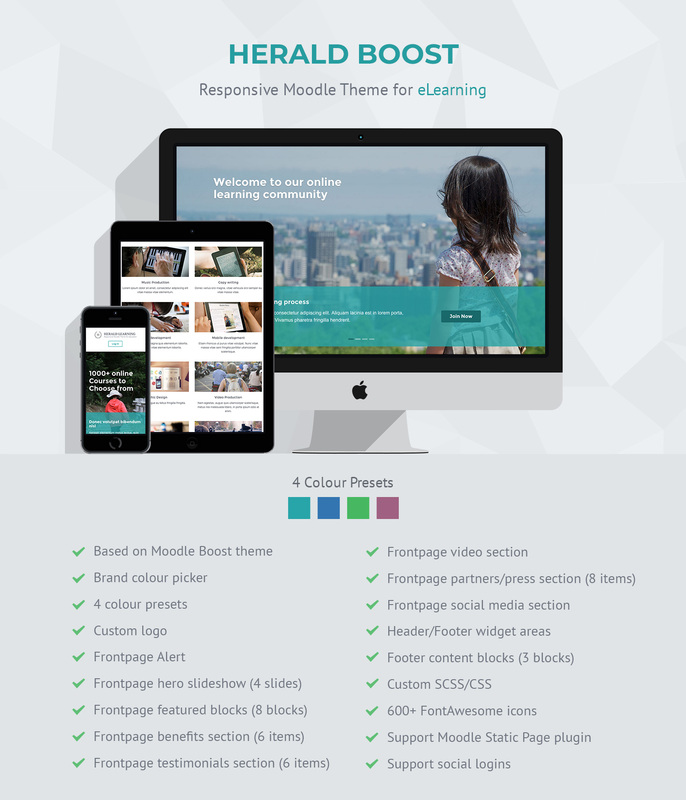 Herald Boost is a responsive Moodle theme perfect for colleges, universities, businesses and government organisations. It’s built based on Moodle’s core theme Boost and comes with 4 preset colour schemes. You can change the primary theme colour easily via the theme settings page to meet your branding needs. This theme uses the latest Bootstrap 4 framework so you can also use Bootstrap’s various components in your course design. Configuring the theme is very easy and straightforward – just follow the instructions on the theme settings page. All of the theme related sections on the landing page can be turned on/off so you can choose the best combination for your own site. Need a matching Mahara theme? We have released a responsive Mahara theme “Horizon”, which is designed to visually match our Moodle theme “Herald Boost”. If you are planning to set up a seamlessly integrated Moodle and Mahara installation (“Mahoodle”), you need to check out the “Horizon” theme. If you would like to report theme bugs and issues, please email us at elearning@3rdwavemedia.com. Where can I configure the theme? I’ve installed your theme successfully but it’s not showing up in the theme selector page. What should I do now? You probably need to purge the Moodle cache. If purging the cache doesn’t work please try the steps list in this tutorial. I’ve received your theme update. How do I upgrade your theme? You need to replace the whole theme folder with the new one to ensure you don’t miss any changes. Also remember to purge the Moodle cache to see all the changes. Will I lose all of my theme configurations after upgrading the theme? No, you won’t. All of your theme configurations are safely stored in your database so you won’t lose anything. I found a bug/issue in your theme. Where can I report it? Please email us at elearning@3rdwavemedia.com with your Moodle version/build and theme version so we can investigate and fix the bug/issue for you asap. Extract the /herald_boost/ folder and the files. For more detailed instructions, please check out our tutorial here.